It can be very difficult for investors to generate consistent returns in the stock market. Picking the direction of share prices can feel more like gambling. Not a comfortable feeling when putting your life savings at risk. When I give talks at different investor conferences, I like to discuss a stock selection strategy that will allow you to generate long-term, attractive returns without having to become an expert stock picker. This is a strategy your broker is not likely to show you. The strategy starts with a simple math concept. 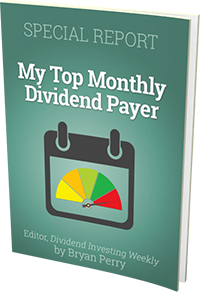 The average annual total return of a dividend paying stock will be the average yield plus the average dividend growth rate. Think of it this way. If a stock yields 5% and the company increases the dividend by 3%, for the yield to stay at 5%, the share price must increase by the dividend growth or in this case 3%. If we add the 3% share gain to the 5% yield, the result is an 8% annual total return. While the math points the way, share prices can’t do math and shorter term returns will vary significantly from the expectation. However over longer time frames, such as five years or more, the average total returns of dividend paying stocks will come very close to the mathematical expectation. To follow this strategy the goal is to seek out stocks that pay current attractive yields. This gives you a nice start towards your total return goal. Then you need to narrow down the list to those with attractive and sustainable dividend growth rates. When looking for dividend growth stock prospects I shoot for a yield plus dividend growth rate total in the low to mid-teens. Here are three stocks that meet that prospective return level. 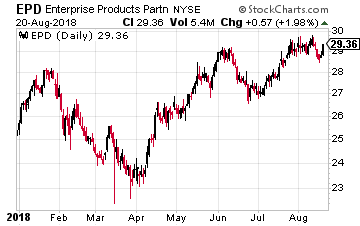 Enterprise Product Partners LP (NYSE: EPD) has a $62 billion market cap and is the largest energy midstream master limited partnership (MLP). The company owns pipelines for natural gas, natural gas liquids (NGLs), crude oil, refined energy products, and petrochemical products. It owns 22 NGL and propylene fractionator facilities. To round out the well to end user chain, Enterprise owns two NGL export terminals in the Houston Ship Channel. Growth is generated through both asset acquisition and development. EPD has grown the distribution paid to investors for 56 consecutive quarters.